You can reach Chapel Porth’s pretty little beach by road (there is a National Trust car park), but the best way to get there is by walking a couple of miles along the coastal path from St Agnes to the north, or from the micro-hub of Porthtowan just to the south. Your reward? A hidden, sandy bay flanked by cliffs and guarded during summer by the red and yellow flags of the RNLI. Your family can build sandcastles, or cavort in the shallows, but the real lure is the Porth Chapel café, with its hedgehog ice cream (vanilla base plus clotted cream, dipped in honey-roast hazelnuts). Eat at The surfy Blue Bar in nearby Porthtowan offers big plates of nachos with guacamole, sour cream and salsa for £9.50 (01209 890329; blue-bar.co.uk). Stay at Rosehill Lodges in Porthtowan has a selection of two- and three-bed self-catering luxury cabins, all with hot tubs (01209 891 920; rosehilllodges.com). 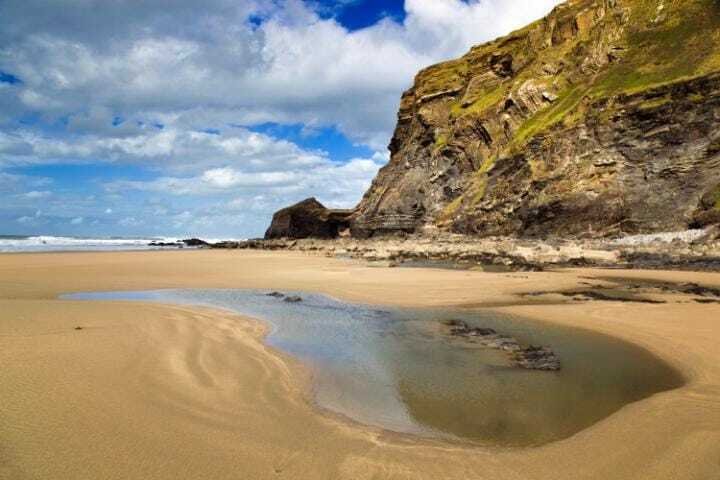 A 15-minute walk south of Crackington Haven (a village that has been listed among Britain’s silliest place names), this is the ultimate dramatic wild beach, the scene of countless shipwrecks and set under some of the highest cliffs in the South West. Follow the zigzag path down through dwarf oaks and heather hummocks to arrive at a huge stretch of low-tide sand. It’s a great place to make a driftwood fire (below the high tide line) and watch the sun set over the sea. Explore at low tide only. Eat at Trevigue Farm restaurant serves home-reared meat and garden produce in season. Open Friday and Saturday evenings. (01840 230 492; trevigue.com). Stay at Pencuke Farm, St Gennys, self-catering farm cottages and upmarket yurts with a lovely farm shop selling local breads, home-baked treats and meats from the farm (01840 230360; pencukefarm.co.uk). You’ll need a head for heights and strong legs to get to this deep, double cove, reached via 220 uneven steps moulded out of a steeply wooded cliff face between Watermouth and Combe Martin on Devon’s wild Exmoor coast. Once there, you can explore the arches, caves, island lookout and tunnels to the west of the bay, and bag one of the large coves for yourself. Eat and stay at The Sandy Cove Hotel (01271 882243; sandycove-hotel.co.uk), a 10-minute walk from Broadsands, along the coastal path. Turquoise sea, offshore islands and sand of fine pearl quartz beads makes this the best of a trio of sandy coves along this stretch of rugged south Devon headland. The approach through quiet meadows is idyllic, and the rope ladder that helps with the last descent adds an extra thrill. Eat at The Pig’s Nose in East Prawle, known locally for its live music (01548 511209; pigsnoseinn.co.uk). Stay at East Prawle has several basic campsites. For something more upmarket, South Sands, in Salcombe (01548 845 900; southsands.com), is a short ferry ride away from East Portlemouth, farther west up the coastal path. Read our full review here. 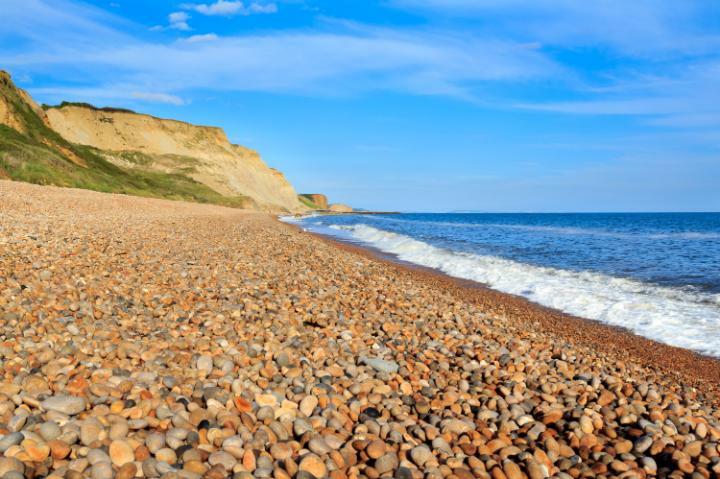 Often overshadowed by its neighbours — Lyme Regis to the west, or West Bay (Broadchurch) to the east — Eype beach is where locals go for seaside seclusion. Narrow lanes snake through Eype village on to the shelving shingle, coloured goldenrod, grey and black. It’s an unexpected find on the South West Coast Path; picnics or midsummer barbecues on the large smooth pebbles are a popular activity. Eat at Downhouse Farm, a 20-minute walk from the beach. Homemade food, much of it from their organic coastal farm (01308 421232; downhousefarm.org). Stay at the Bull Hotel (01308 422878; thebullhotel.co.uk) for chic rooms with a Regency edge, two miles away in the centre of Bridport. Doubles from £117, with breakfast; read our full review here. The 20-minute walk to this near-isolated shore on the Isle of Purbeck is worth it: wind-carved stones sweep round in a crescent, beside cliffs of chalky white or sandy brown rocks. 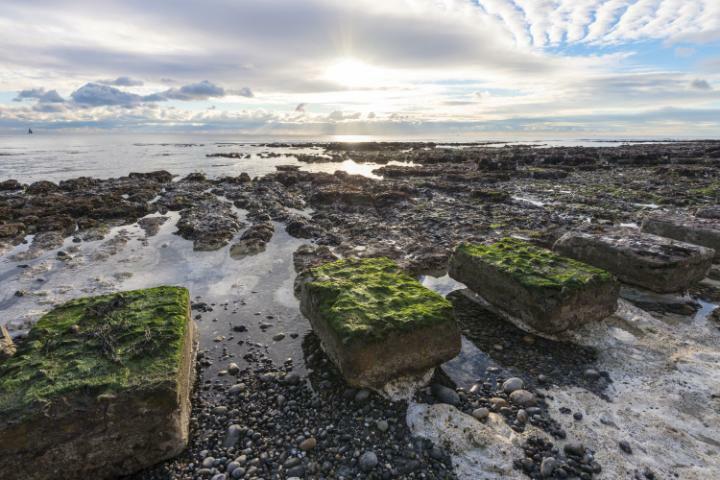 Strolling east, you will find Mupe Rocks, large rugged stacks jutting from the shallows. The closest parking is a mile away in the ghost village of Tyneham. The bay lies within the Army’s Lulworth Ranges, so it’s only accessible at weekends and on specified dates. Eat at The Weld Arms in East Lulworth, an unassuming thatched pub, opposite Lulworth Castle, offering light lunches, fresh seafood, Dorset ales and ciders (01929 4000211; weldarms.co.uk). Stay at The Pig on the Beach (0845 077 9494; thepighotel.com), 10 miles east, but easily the best spot in Purbeck, overlooking Old Harry Rocks. 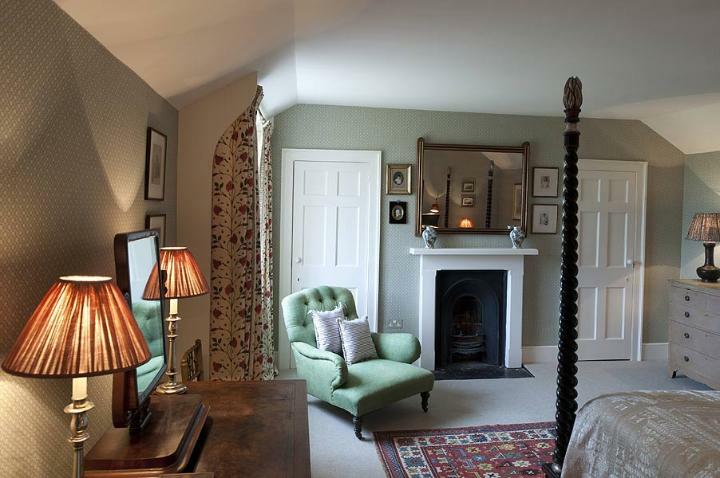 The vintage-meets-contemporary manor house offers access to Studland Bay. Doubles from £209 a night; read our full review here. The beach at Steephill Cove, just south of Ventnor, can only be reached by foot (most easily via the coastal path from Ventnor or the Botanic Gardens). This little bay of cheerful beach huts, deck chairs and rock pools is backed by cottage gardens and bathed in Mediterranean-style light. Winter storms have washed away most of the sand, so it’s now shingle, but no less charming. Eat at Wheelers Crab Shed café for fresh crab sandwiches or lobster and salad; or the Boathouse restaurant (01983 852747; www.steephill-cove.co.uk/restaurant) – both overlooking the beach. Stay at The Boathouse self catering (as above), or the Royal Hotel in Ventnor (01983 852186; royalhoteliow.co.uk) – doubles from £90; read our full review here. While Brighton is lovely much of the time, no one wants to play sardines on a hot weekend. The beach at Rottingdean, just beyond Brighton Marina, offers respite from the maelstrom and provides plenty of distractions for kids. Go armed with reef shoes and buckets – at low tide its rock pools teem with crabs. Stroll the Undercliff walk from Black Rock to Saltdean, or take the Coaster 12 bus. Eat at The little café on the beach, serving tea, good cakes and bacon sandwiches. Stay at Drakes Hotel, Brighton, a boutique seafront hotel conveniently located for Rottingdean, and close to a bus stop (01273 696 934; drakesofbrighton.com) – doubles from £120; read our full review here. Eat at the Harbour Inn in Southwold (01502 722381, harbourinnsouthwold.co.uk), a harbourside pub with plenty of outdoor space overlooking the river Blyth. Stay at Church Farmhouse b&b, a Grade II-listed farmhouse in three acres of orchard and garden at Uggeshall (01502 578532, churchfarmhousesuffolk.co.uk), doubles from £95 a night. Soft, yellow sand, backed by grassy dunes, on Norfolk’s less-visited north-east coast. Waxham merges with the neighbouring beach of Sea Palling to the north, making this stretch a good choice for long seaside walks. Expect peace and space, plus the chance to see grey seals lolling lazily at the water’s edge. Behind the beach is a small village with a restored, 16th-century barn housing a café that serves teas and light lunches (see norfolkhistoricbuildingstrust.org.uk). Parking is on the roadside. Eat at the Gunton Arms, in Thorpe Market, near Cromer (01263 832010; theguntonarms.co.uk). The 20-mile drive is worth it for the steaks, chops and ribs cooked on the open “Elk room” fire. Stay at Tinsmith’s House in Aylsham, a cosy b&b in an interesting period building serving good breakfasts. Doubles from £105 a night. Or The Gunton Arms, doubles from £95. 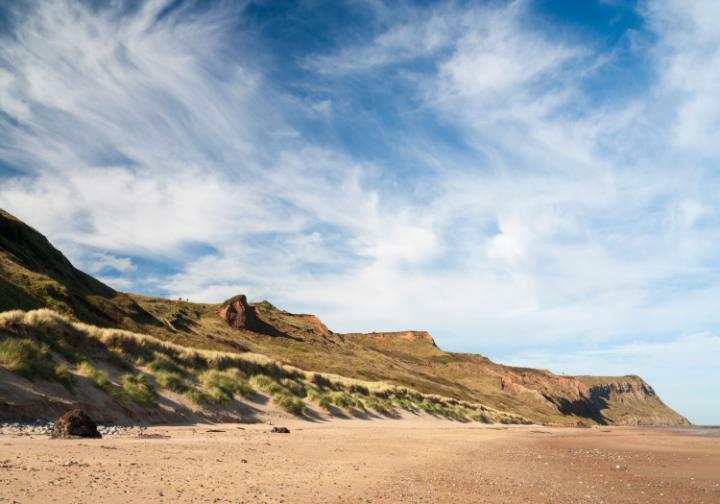 This beautiful wildlife reserve contains one of the wildest and least accessible stretches of sand on the entire North Norfolk coast. Get there by ferry from Burnham Overy Staithe, which operates a couple of hours either side of high tide. Alternatively, keep to the east of the creek and walk a mile or so along the raised sea-wall from the quayside to reach high dunes, marram grass and surfing waves. Eat at the water’s edge. There are no cafés here, so buy picnic supplies from the delis and fishmongers of Burnham Market nearby. Stay at The White Horse, Brancaster, with spectacular views over the coastal saltmarshes; doubles from £100. 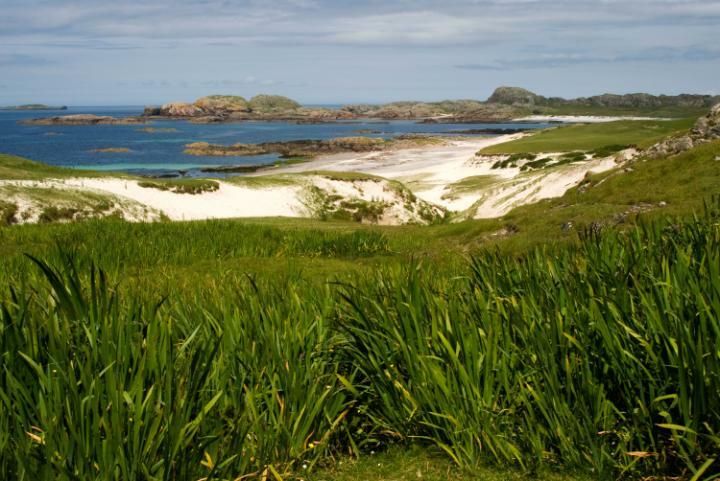 This spectacular beach and little-known bay is sheltered behind high crags and a grassy meadow. There is clear water and beautiful sand. A strange ruined pier still stands here, built by the Skinningrove Iron Company in 1886 for loading ore on to steamers bound for Middlesbrough. Adventurous local swimmers practise swallow dives from its heights and snorkel its depths. Eat at the Ship, Saltburn-by-the-Sea, a popular pub, right down among the boats, with beams, good beer and fish and chips (01287 622361). Stay at the Captain Cook Inn, well priced with wonderful views over the quaint fishing village of Staithes. Doubles from £80, including breakfast. (01947 840200, captaincookinn.co.uk). Eat at Mary Rowntrees – occupying the former St Andrew’s church – which serves posh fish and chips. (01429 868313, facebook.com/maryrowntrees). Stay at Ship Inn, High Hesleden. A mile inland from the beach, this popular family-run pub has a comfortable motel-style extension at the back. The food is excellent, too (01429 836453, theshipinn.net). It is only a short walk to these sweetly named sands between the market town of Alnwick and the eerie remains of Dunstanburgh Castle. A pretty little stream runs down through woodland and there are plenty of trees from which to string your hammock. A little farther on, at Rumbling Kern, are fabulous rock pools that are large enough to swim in, and extraordinary rock formations, with ledges for jumping. From Longhoughton (B1339), turn for Low Stead Farm opposite the church, walk through the farm to the dunes, then head left up the coast for half a mile. Eat a picnic sourced from Robson’s fish smokery in Craster (01665 576223) or sit down for crab sandwiches at The Jolly Fisherman’s in Craster (01665 576461, thejollyfishermancraster.co.uk). Stay at the Bathing House, Howick, which can be rented by the week. It’s set on the cliffs, with spectacular sea views (016977 46777, northumbria-byways.com). The Gaelic name of this idyllic bay of white sand and shingle, Camus Cul an Tabh, refers to the fact that the next landfall is Newfoundland. Bounded by carpets of wildflowers in spring, it is a short walk along a farm track from the peaceful island’s famous abbey, but few visitors are aware of it. Eat at Martyr’s Bay Restaurant is the only pub on Iona, serving hot and cold snacks all day, bar food and evening meals featuring steaks and local seafood. (01681 700382; martyrsbay.co.uk). Stay at the 19th-century Argyll Hotel by the ferry landing overlooking the Sound of Iona (01681 700334; argyllhoteliona.co.uk). 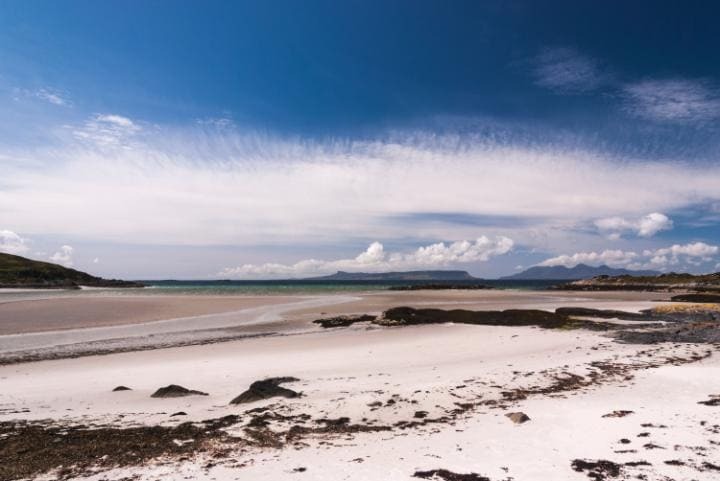 A series of pure, white sandy beaches between Arisaig and Morar in the West Highlands, with views over the sea to Skye and the isles of Rum, Eigg, Muck and Canna. Featured in the film Local Hero, they lie near the end of the “Road to the Isles” from Fort William, one of the most scenic routes in Britain. Eat at the Old Library Lodge in Arisaig is a waterfront restaurant with rooms, serving imaginative bistro style food with local produce (01687 450651; oldlibrary.co.uk). Stay at the Arisaig Hotel, an 18th-century coaching inn with sea views. It is dog friendly, and has bicycles and kayaks for hire (01687 450210; arisaighotel.co.uk). More than a thousand golden acres of pristine dunes sweep their way down to the Cumbrian coast from the high mountains of Scafell Pike behind. This is a great place to escape the crowds of the Lake District – your only company will be the natterjack toads, great crested newts and adders that thrive in this special landscape. The dunes connect to Ravenglass, where you can pick up the steam train that takes you up into the Esk Valley. Eat at the Ratty Arms, a quirky, family-run pub near the seafront in Ravenglass, with food sourced from local producers (01229 717676). Stay at Coachmans Quarters b&b in the grounds of Muncaster Castle, near Ravenglass, with views out over the dunes (01229 717614, muncaster.co.uk). 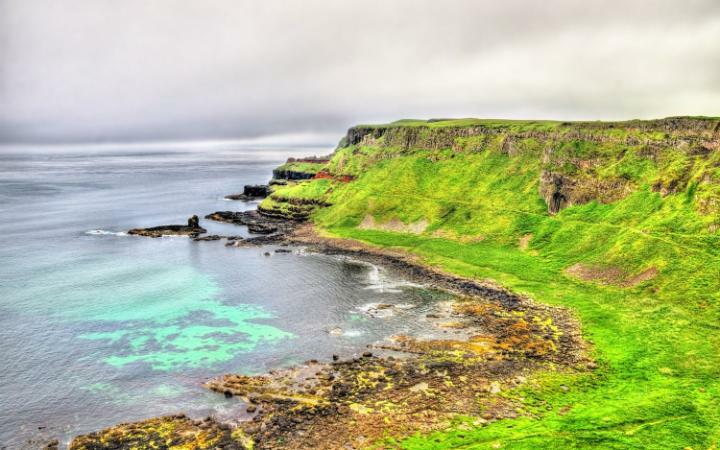 Patrick Barkham, walking this glorious three-mile arc of beach between two headlands near the Giant’s Causeway for his book Coastlines, wrote that the sand was “so fine it squeaked”. It’s a great spot for picnics, sandcastle-building and nature trails (otter prints were photographed recently). Ocean currents can be strong, so it’s not ideal for swimming. Eat at Roark’s Kitchen by nearby Ballintoy harbour – a setting for Game of Thrones (it’s Pyke, capital of the Iron Islands) — for lunchtime soup and sandwich, and the Bushmills Inn (bushmillsinn.com) for dinner. Stay at Whitepark House, which dates from 1730 and has three double rooms; b&b for two from £120 a night (028 207 31482; whiteparkhouse.com), or at the youth hostel directly above the bay (hini.org.uk), with views to Scotland. It’s at the end of the road on an island off Wales, and on a clear summer’s day the peaks of Snowdonia float like a mirage in the blue yonder. During gales it turns it into a Celtic Gobi desert, while in balmy heatwaves it outshines the Med. At one end of the three-mile beach is a little island that can be reached on foot at low tide, with a terrace of pilots’ cottages and a miniature lighthouse. The pillow-shaped rocks nearby are the remains of lava-flows from undersea eruptions. Eat at the Marram Grass Café, which serves Menai mussels, Welsh lamb and catch of the day (01248 44 00 77; themarramgrass.com). Stay at the Outbuildings, a stone-walled barn and granary converted into four cosy cottages and a shepherd’s hut; doubles b&b from £75 a night (01248 430132; theoutbuildings.co.uk). This small, dune-backed, sheltered area at the eastern end of Saundersfoot’s sandy beach is right on the Pembrokeshire Coast national trail. 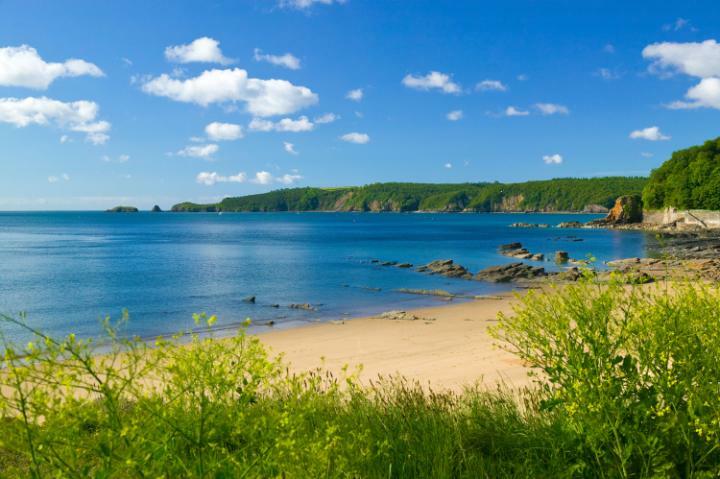 Gentle tides and shallow, warmish seas make it popular with families and picnic-ers who don’t want the hullabaloo of Tenby. Eat at Coast, where chef Will Holland focuses on fish and seafood. Especially lovely in the evening (01834 810800; coastsaundersfoot.co.uk). Stay at the Grove, Narbeth – this grand country hotel has airy, stylish rooms and is ideal for exploring the foodie town; b&b from £180. This former Victorian hunting lodge, which lies half an hour’s drive off-road into the mountains, relies on its own renewable electricity supply to power the satellite TV, DVD, central heating and kitchen that make this the perfect family retreat. Kids can run wild in the six-mile valley that surrounds the lodge, and fishing, clay-pigeon shooting and guided mountain hikes can all be arranged. The house is comfortably furnished and about 40 minutes’ drive from the beaches of the west coast. Red deer and eagles populate the valley and can often be seen from the garden. Sleeps eight. This Grade II-listed farmhouse is in a breathtaking location next to Whitewater Dash waterfall and surrounded by vast expanses of rugged Lakeland scenery. There are stunning views from every side of the house: behind lie the Uldale fells; to the front Skiddaw, the fourth-highest peak in England, stretches to the sky. It’s about a mile from the nearest public road, and there are no other houses to break up the views, just grazing sheep and a few cattle. The house has open fires and a traditional kitchen. Sleeps six. Wide expanses of heather moorland stretch from the walls of White Edge Lodge, originally a gamekeeper’s cottage on the Duke of Rutland’s Longshaw Estate in the Peak District. The cottage has been restored and has many original features, including the former game cellar, which has been turned into a sleek kitchen. You can walk to the pub, and the vast spaces are perfect for long rambles and letting the kids run wild. Sleeps five. The cove and land around Welcombe Mouth is one of the most unspoilt places in the West Country, and Moons House lies 150m down an unmade track, about half a mile from the beach. The house is surrounded by three acres of gardens, and the National Trust property beyond is home to badgers, deer, and many species of bird and butterfly. 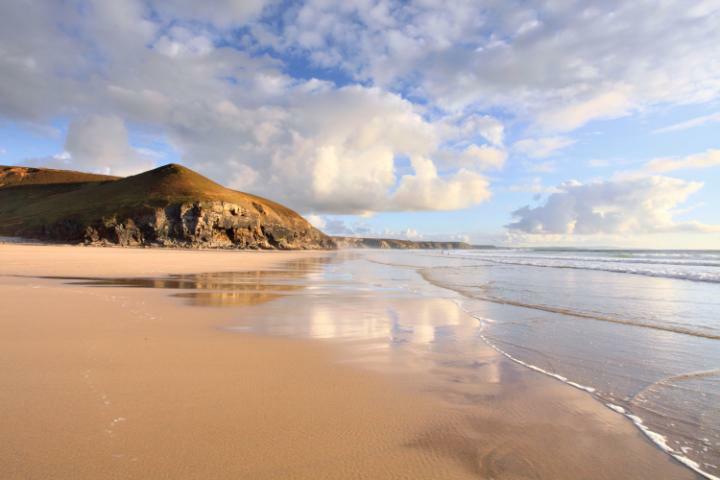 There is great surfing to be had at the beach, and the hamlet of Welcombe is a mile away. The house is elegantly furnished, with a fully fitted kitchen and bunk beds for the kids. Sleeps seven. Badrallach is a Highland loch-shore croft that sprawls across 30 acres of empty Scottish landscape, and offers a choice of accommodation to suit most families’ needs: a bothy, a comfortable self-catering cottage sleeping four, a campsite and bed-and-breakfast at the house, each situated in their own isolated area within the croft. Badrallach is at the gateway to the Scoraig peninsula (accessible only by boat or a 10-mile walk) where a small alternative community exists. The croft is surrounded by excellent walking country; the loch is ideal for fishing and can also be explored by kayak, inflatable dinghy and canoe. There is no vehicular access to this cottage, so visitors have to walk down a 300m path to take up residence at this former lighthouse at the furthest end of the Roseland peninsula. There is no public access, so the cottage is completely private and the observation room with its vast picture window gives spectacular views out to sea. The lighthouse is still operational, but in case you’re unlucky and the fog horn is sounding, the owners provide earplugs. Surrounded by National Trust land, it offers some delightful walks, and there is a bird-watching hide a 10-minute stroll away, where you can watch peregrine falcons. Sleeps four. Proof that a rural location does not have to mean skimping on comfort, this 200-year-old farmhouse has been renovated in a cool modern style – lots of cream walls, blond wood and Moroccan touches – with the original features, such as beamed ceilings and oak floorboards, retained and restored. The kitchen is particularly well-equipped, making this an ideal choice for a stylish house party, and its location – four miles from the nearest main road – guarantees privacy. There are walks from the front door, red kites wheeling in the sky above and stunning views along the valley. Sleeps seven. Accessible only by boat or down a steep 200m path from the nearest road, Ropehawn is a former fisherman’s house, and the sunken garden was originally a salt cellar used for salting the day’s catch. Although just two miles south of St Austell, it feels totally secluded; the house is swamped by gorgeous views across St Austell Bay and there is not another property in sight. There is good swimming right outside the walls and a private rocky beach is revealed at low tide. There is a rowing boat for exploring on the water and a deep mooring for those who wish to bring their own boat. Sleeps nine. 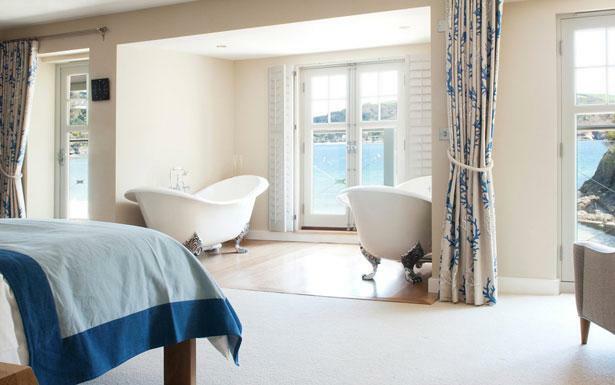 The Colonsay – on the island of the same name – has an elegant, contemporary feel, with just nine bedrooms. The ferry crossing from Oban takes just over two hours, transporting you to a world of glistening empty beaches, dramatic lochs and cliffs and a world where seals, goats and sheep outnumber people. Amid such isolation, the comforts of the Colonsay seem even more remarkable: a top-notch but informal restaurant serving locally sourced seafood and organic produce, fire-lit lounges with painted floorboards and deep sofas for winter and view-strewn terraces for summer, with an extensive wine and whisky list. Built as a country house retreat for a wealthy family in the 19th century, Dolserau lies half a mile down a private driveway and is surrounded by meadows and the lush River Wnion valley. Egyptian linen, Molton Brown toiletries and unbroken views from every window make the rooms feel nicely indulgent, while dinners of local game, fish and cheeses are the perfect finale to an afternoon spent stomping through the countryside. The hotel sits in five acres of grounds in the Snowdonia National Park, meaning all sorts of activities, from fishing to whitewater rafting, are on the doorstep. Accommodation doesn’t get more basic, but staggering views and a sense of glorious isolation, make this rough stone-walled hut a more memorable place to stay than any of the world’s finest hotels. It sits alone beside a little river in a flat meadow, at the edges of which dramatic peaks rear up on every side. To get there, you have to walk about seven miles east from the point where the road ends in Glen Nevis. There’s nothing there: you bring your own sleeping bags and firewood, draw water from the stream and take your rubbish away with you. Meanach is one of more than 100 mountain bothies in Britain – small huts that are left open for anyone hiking in the hills to make use of. The Mountain Bothy Association is a group of volunteers who maintain the bothies, although the buildings themselves still belong to the local landowners. Finding bothies can be tricky – the MBA does not publish their location for fear of vandals rocking up for wild all-night summer parties – but hiking guidebooks and websites will lead you to them. Book it: Just turn up . For more on bothies visit http://www.mountain bothies.org.uk. Squirrelled away down a rugged track that passes through stunning National Trust land, Penrhyn cottage on the dramatic Strumble Head peninsula has no electricity (lamps and candles have to suffice) but instead offers some mesmerising views of the cliff-dominated landscape and the vast sea that lies beyond it. The traditional split-level stone cottage is very cosily furnished and handily located for the Pembrokeshire Coastal Path, where the waymarked paths give plenty of possibilities of seeing seals and porpoises. Although the cottage does feel miles from anywhere, the pretty town of Fishguard is only five miles away. Sleeps six. Landmark Trust properties may be simply furnished, but what they lack in modern luxuries they tend to make up for in scenic locations. A wheelbarrow is provided at Purton Green for you to transport your luggage the 400m from where cars have to be left. 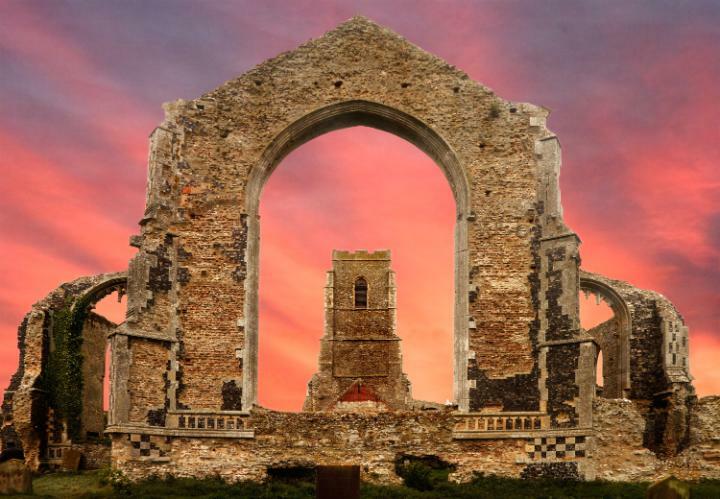 This stunning medieval property has a central hall that dates from 1250, though what is now the main living quarters was rebuilt in around 1600. The cottage is the sole remaining house of a ‘lost village’ – one of many in Suffolk that were once small thriving communities but no longer exist – and is surrounded by open fields. Sleeps four. England’s most remote youth hostel is well known: a simple shepherd’s bothy at the head of Ennerdale that offers great walking on the surrounding fells including Great Gable, Red Pike and Steeple. Facilities are basic – there are no double or twin rooms, just two sleeping four people, and one dormitory that sleeps eight. However, there is a restaurant that offers evening meals along with a surprisingly good organic wine list, and good self-catering facilities. Although electricity was recently installed at this youth hostel, there is little else to distract from the feeling of being surrounded by nature. The Bunkhouse is a mile from the nearest house and the nearest pubs and shops are at Llanddewi Brefi, almost seven miles away. Tyncornel is birdwatching heaven, with red kites, buzzards and ravens all easily spottable, and the house makes a great base for walking and cycling around the remote countryside. There are two rooms with eight beds, camping facilities and a dining room and self-catering facilities. Book it: From £10 a night through YHA, as before. This absolute gem is hidden away in the heart of the Shropshire countryside – an 18th-century folly built in the grounds of a manor house that, sadly, no longer exists. The Temple, which was built to classical proportions with a colonnaded balcony and an elegant sitting room on the ground floor, where tea parties would have been taken, has been creatively restored, with a period feel very much in mind. In addition to a fully fitted kitchen and modern bathroom there is a very cosy double bedroom below. The balcony was designed to make the best of the stunning and unbroken views of more than 40 acres of countryside. After spending the morning enjoying the scenery, you can pack your lunch, pull on your wellies and ramble off into the undisturbed woodland straight from the front door. Sleeps two. If you’re driving to this hotel make sure you have plenty of fuel: the nearest garage is 38 miles away. In the heart of Rannoch Moor, one of the most spectacular wildernesses in the UK, the hotel lies 16 miles from the nearest town, Kinloch Rannoch, although a tiny railway station is just a minute’s walk. 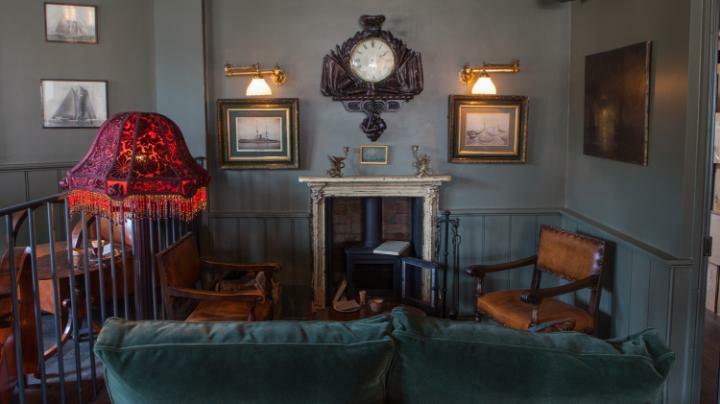 Ideal for escaping from everything and just spending time with a partner, there are walks of every level from the front door, but the real joy is curling up in front of a roaring log fire and enjoying the slap-up suppers of locally reared meats. Steeped in mythology and religious history, Bardsey, two miles off the Llyn peninsula, feels as though it has remained unchanged for centuries. There are houses to rent that rely on candles and gas and have outside chemical toilets. The island itself is magical; home to artists and new-agers lured by the wild landscapes, ancient ruins and burial sites that are scattered across the hills. Cutthorne is a Georgian farmhouse at the heart of a 25-acre estate, in its own private valley on Exmoor. There are three rooms in the main house offering B&B and dinners, and two cottages, each sleeping up to four, whose residents can also take meals in the main house. Two miles from the nearest village, the house has its own trout lake, and fabulous walks all around. Food is an important part of a stay: slap-up breakfasts of local meats and seasonal fruits, and packed lunches. Few things are more romantic than staring up at a starlit sky, and Kale Pot – a converted 18th-century barn tucked down a tiny road on the North York Moors – has nothing else near it to spoil the view. There are miles of forestry tracks starting from the door of the cottage, but it’s tempting to just crack open a bottle, fire up the barbecue and let complete silence wash over you. The only neighbours are roe deer. Today I will tell you the wonders of life. Because these days we need a miracle. Some people are accustomed to living bad events in their lives. So they don’t know what is the miracle.Or is there miracle? Did you ever thank you for being alive , breath? As can walk or run. What about using your hands. Do you know what is the all about meanings? This is the miracle. If the opposite were true. That’s when life would be more difficult for you. Imagine you will not do anything. Everything will be bad for you. Always going to be upset and unhappy. I’m so sorry because when I see a human in this case . I know of course they are not unhappy But I feel bad. And than I said ” Thank you God for my health”. This is so important for human life. Maybe some people get mad at me. Please do not get it wrong. Just I want to say know the value of life. 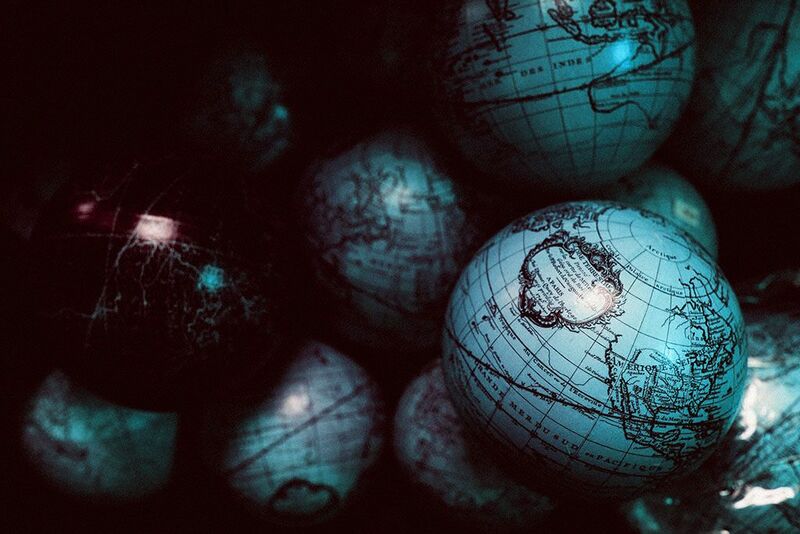 Everything is in your hands. If you want to be happy or unhappy. I did not believe in miracles in advance. But I believe now. Yes there is a miracle. I’m convinced that miracles. Why people only remember the bad memories of the past. What about the good ones. I always remember the bad ones previously. And than I said myself ” WHY”. But I didn’t find my answer. And than I decided. After this I’ll remember good events. And now just I remember good things. If you’re feeling sad and lonely from some reason, Just remember your happy time. Forget the rest. Just try to live happily. Forget bad situations. Because life is really too short. just struggled to achieve the goals and dreams. And Believe yourself. Because I believe myself. One day I’ll do it everything be real. These are my thoughts.